This past Saturday, I (Shannon) met up with Jia at the arts and crafts store, Michael’s, to purchase felt, string, and scraps of crinkle and gift wrapping paper in assorted shades of brown and black to achieve an authentic, “Underground”-feel. We have five black copies of the book that are brimming with crinkle paper to signify messiness and the wooden boards of the floor the Underground Man lives under. Then, we also made five brown felt covered copies of the book, which are neat and beautiful, to represent the ideals that the Underground Man believes in and attempts to pursue. All of the copies will be bound by twine-like string to capture the sense that we, too, were struggling underground while making these books and could only tie together our manuscripts with bits of string that we scrounged up. As we get into the actual labor of making our ten copies of the Book About a Book project, we are getting into a position where we are more informed and better able to answer the professor’s questions and delve into details. The audience of our book will be art critics, art enthusiasts, and consumers of culture. This broad category includes students of this class and the professor, but also the greater art community that appreciates punk zines and grungy garage band style music. After all, Dostoevsky’s novel was published near the turn of the century, at the end of the Victorian era for many Western countries, where traditions were beginning to be questioned and subverted. Our book’s chosen format and methodology is reflective of those historical implications. This particular aesthetic of embracing free will and the tendency toward messiness and chaos is very popular amongst purveyors of modern art and the pioneers of the modernist art movement. As we finish up our book, we have made a series of changes and upgrades to our initial idea. We will order our copies of the book as one through ten. The second book and the fourth book will have a special connection (more details on this will be determined as we reach completion of the project) to reflect the prominence of the mathematical formula 2 x 2 = 4 in Dostoevsky’s novel. The order of the contents of our book will vary from copy to copy, thus giving each copy a distinct and unique feel. The reader will get a different experience and interpretation depending on which copy they read. The text and graphic parts of our book will be photocopied and reproduced for each copy but each copy will come with its own unique short poem to give the copies its own bit of fresh content. The many poems will be reflective of the Underground Man’s garrulous tendencies and his ability to write on and on forever so much so that Dostoevsky, or the implied editor of the manuscript, had to cut him off at the end of the text. We really like the professor’s idea about making part of the text ask the reader to flip the book over and start reading in a different direction, but as we haven’t reached this step yet, we are unsure of if it would really look good and be effective upon execution. As a group discuss and respond to the feedback you received from your previous check-in. For this check-in, have one person post the group’s substantive and well thought out responses to all the questions and concerns I posed. Remember to check any and all relevant category boxes. For our book about a book project, we have decided to create 8 journals or reflections of Hester Prynne. The journal is intended to look like something Hester has created. In terms of material and visual display for our book, we’ve come about with the idea of creating a book that seems timeless/old, maybe torn and very used. The material for our pages inside the book will consist of a simple brown paper. My group members and I will enhance the worn out look of it. Also, on the top right corner of each page, our group thought about having a small but visible imprint of the letter “A”. We were thinking, for textual purposes, like how a letter was stamped with wax, we can find something similar to represent the “A”. We took a slightly different approach for the cover, but with the same vintage feeling. We were thinking, if possible, our cover will be made out of a soft wood, maybe chipboard. But, we would probably use more than one piece for thickness. Also, the binding of our book will be somewhat sewn together out of fabric. The design of the cover will have a large imprint of the letter “A”, also inspired by the paper haptic experience. Being that the narrator of the book itself tells this story based on a manuscript he finds in a customhouse, our group felt it would be appropriate to make a physical book. Since our ‘book about a book’ will be from the perspective of Hester, we are going to make it with specific materials that reflect Hester’s character. As Hester was isolated to the outskirts of the town as close to the woods as one could be, we decided to make the book out of natural-looking materials. The idea being that Hester created this journal herself out of materials she found and made use of around her house. Our group is making the pages look worn being that this will be a book that will have been made during a time of Puritan settlements. The materials we use to make the book will reflect Hester’s individuality such as the binding of the book being sewn, as that was something Hester was known around the town for. By creating a book about a book in the form of a journal, we hope to make the readers of our book look at the story in a new light. It was originally written by a narrator in the third person, but our book will be from the perspective of a specific character. After I attended the book series panels, I realized the important of the haptic experience of paper. This influenced my group and I to make sure there is a physical component and experience for the reader. Making the paper look and feel worn and marked reflects Hester as an individual as she has been marked with the letter ‘A’ and been through difficult times herself. By stamping the letter ‘A’ onto the paper with a material that sticks out from the paper and can be felt, we hope to highlight the letter Hester had to wear that stood out from everything she wore. We plan to use the materials mentioned above as well as more that we think of in the future to reflect the personality and experiences of the character we are making our ‘book’ from the perspective of. We’ve decided unanimously to create a series of black and white pencil sketches coupled with explanatory text and analytical details in a handmade collage and mishmash of pieces bound together by string and hole punched. These black and white pencil sketches will include etchings of the Underground Man and the various villainous characters he meets along his journey that eventually lead him to hide underground. The cheekbones of the Underground Man are very defined; this is one characteristic of his face that the readers can use to differentiate this character from the others. Additionally, his eyes have very dark circles, from the lack of sleep and heavy buildup of anxiety he suffers from. All of these elements have textual evidence to back them up. There will also be one sketch reflective of our field trips, most likely influenced by the anime event some of us attended. Our descriptions will include a few, extremely brief poems inspired by the Underground, essay-like analyses, and an introduction to our book. Unfortunately, with the formatting we’ve chosen, there can only be one true original and nine copies but even this too is significant. I doubt the Underground Man was sitting in the underground handwriting dozens of copies of his manuscript. Of course, there was only one, original manuscript in the story. This manuscript will be represented by the Book About a Book that we formulate. Additionally, the Underground Man’s obsession with math, with his own appearance, and with the haven-like qualities of the Underground will all inspire the way we craft the Book About a Book. More specifically, we will include formulas, drawings of his face, and dark poems and sketches that reflect the romantic appeal of the Underground. Furthermore, this format best allows us to display what we’ve learned about the craft and labors that go into making a book, since we will be making everything from scratch, in collage form. The repetitive nature of our work will reflect the repetitive nuances of the Underground Man’s thoughts as he ponders humankind’s free will over and over throughout the text. All these darkly romantic and confused pieces will come together to form a somewhat incoherent whole that captures the essence of what makes Notes from Underground great. It is quite literally a text that is befuddled–that is precisely the point. It was written at a time when the world was feeling confused, when an author finally admitted to and encapsulated that feeling in a text for the world to behold, and it had never been done before. By taking bits and pieces from god knows where, we will form a Book About a Book that is the ultimate homage to Fyodor Dostoevsky. Our group is planning on purchasing a set of 10 small journals for this project, to use as our starting point. We will be purchasing the journals rather than making them ourselves to represent the pilot’s connection to the society surrounding him, beyond the reaches of the desert in which he finds himself. The journal cover will appear simple, and be smaller than the size of a normal sheet of paper. This size and appearance is to ensure that it appears realistic as to what the pilot may have on his person while stuck in the desert, in order to record the events of his days. Although we are looking at a few different options for the journals, we are currently leaning towards one that features a brown, sandy looking cover, to give the journal the look of blending into the sand of the desert. We will decorate the journal to appear as though it has been used as the pilot’s actual daily diary while stuck in the desert, including some visible “wear and tear.” We are not positive how we will do this yet but this may involve something along the lines of using tea bags to make the edges of the pages look worn. At the top of each page, we plan to organize it as a journal entry being that we will have “Day 1, Day 2, etc.” as the headings. We will then go on to incorporate the necessary information for the project into those “entries” although we have not yet decided if we will organize our information from the perspective of the pilot or otherwise. Another option we are considering is adding certain journal entries which feature the pilot contemplating the existence of the prince, as it was a large uncertainty to us when reading the book ourselves. In this way we can challenge the existence of the prince from the perspective of the pilot’s experiences, and in doing so address part of the reason as to why we see the book as being great. We want to use a physical book in this way to connect the story as much as possible to the actual events that took place in the pilot’s life. In reality if the story were to have actually happened and the pilot had wanted to record it, he would have done so on whatever he had with him. For most taking part in such travels as he was, this could very likely be a small journal in which he keeps track of what happens every day during his time away from home. In this way, we can bring our own description and interpretation of the key elements into the form that most accurately represents his experiences. Much of this interpretation also came from one of the field trips which I attended, at the Grolier Club. In this exhibition I witnessed a variety of different paper forms which featured different engravings. What was noteworthy about this samples on display was that the engravings were simply added to regular paper after they were completed, without using paper that has meaning such as what I learned many did from the panels at the Center for Book Arts. In addition, the engravings often had personal meaning to the artist, and not even the people for whom the engravings were being done. This relates to our own project because we will be taking already made paper, and adding something to it such as the “wear and tear” as earlier explained. In addition, the features of the book such as its sandy color and the worn appearance we will attempt to create, will relate to a personal meaning the narrator of the story may feel and not necessarily its readers. The sandy cover can remind the pilot of the desert while not impacting readers in any way. Although final details of our physical book are not yet set in stone, we plan to follow this description as closely as possible to give our book the greatest possible accuracy as it relates to the original story. Our group has decided to create a physical book for this project. It is going to be a graphic novel just like American Born Chinese. We are not going to draw the graphics like the graphic narrative exercise we did in class. Instead, we are going to create the book using Adobe programs. After all the content is finished, it is going to be printed out on tabloid size paper. A tabloid size is 11in. X 17in., and it is going to be folded in half so the final product will be 5.5in x 8.5in. After we fold it, it will be hand bounded like how Professor Allison taught us at the book making event. The reason why we decided on utilizing Adobe programs to create our book is for consistency. It would help us manipulate presets on the program rather than drawing over and over again. Additionally, it’s also best for when we print and create the actual book as each copy will be almost be exactly the same. 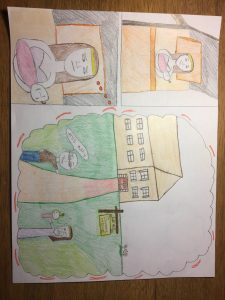 By creating a graphic novel, we hope to pay tribute to the original creator by adding in our own ideas and to keep a consistent theme. Graphic novel also makes it more engaging for readers because it displays facial expressions and other visuals. Since we are focusing on creating a graphic novel, we will print it in color to further reinforce our story. 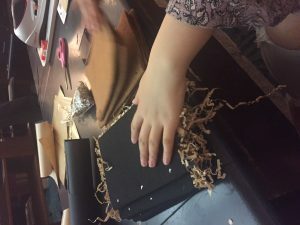 The reason why we wanted to hand bound like how Professor taught us at the book making event is because two of our group members, Sarana and Hnin, were able to make it to the event. Thus, they would teach us what they learnt; we think it will be unique skill to have. Lastly, we will try to incorporate colors such as red, green, and yellow in our cover. According to an online source, these colors are symbolic colors for Chinese culture. Red symbolises joy and good fortune whereas green represents health, prosperity, and harmony. Lastly, yellow is the color of heros. Since American Born Chinese included a heroic character, a Chinese character, and each character finding happiness, we thought it’d be best to emphasize the title or images on our cover with these colors. Why is this text great? – a description of our opinions and experience reading the book; light colors and standard text to be aesthetically pleasing to the reader. How has this work been persevered over time? – connecting to the reasoning of “why is this text great?” we can use the context in why we and how we think this book has been persevered. How we plan to do that? – create a page for the characters we feel had the most impact and influence in the text; each page will be personalized to each character’s personality and characteristics. We’ll include a strong quote that stood out to us and why we chose that character. Close reading analysis – using our papers, we’ll combine our analysis and create unique pages for each; to describe the close reading quote or phrase chosen, we’ll use colors, attach certain textures and use specific font types as well. How does this work connect with the authors other works? – There are a number of works by Toni Morrison in which we can compare Beloved An obvious comparison we can make is the consistent cover pages and fonts she uses for her books. She also has many novels written in the same time period as Beloved which we can compare. How does a text become great? – As a group, we will discuss and put together our own opinions on how a text can become great. We will give each other our own page to describe what we believe is great and then compare our opinions. Bibliography – same text used in “why is this text great?” to keep the appeal. The reason our group chose to do a physical book is because of the event at the Center for Books Art called “History of Art Series, Panel 3: Paper as Haptic Experience.” The event described many different books that used creative paper and textures to make the reader really feel what was happening. Beloved is a book filled with strong emotional moments where we feel that can only fully be portrayed through color and texture. The book goes back and forth from the present and the past. The character Beloved represents the past as well. In order to reflect that in our book, we will be using paper that appears to be older mixed together with paper that is newer. We have not completely agreed on a cover page, but Toni Morrison has a collection of books with the same font as Beloved on the cover. We think using that same font will be a good comparison for us to use later on in our book. In the third section (listed in the what) we want to create pages for the characters and moments we feel were the strongest and that made the book great. With this, we want to use colors, textures, fonts, and more to give a better feeling of the moment and/or the character’s background. An example of this would be when Sethe chooses to try and murder her children rather than letting school teacher take them. Although we can put that moment into words, a page with red to represent blood, rips to represent the beatings she took during slavery, and wet spots for tears (from the pain she’s haunted by), is more powerful than words. For the close reading, we are going to put our papers together and pick two or three of the strongest quotes or phrases to further elaborate on. Each close reading will have its own page with a unique background to fit the feelings portrayed in the text. In the seventh section (listed in the what) we also will be putting our thoughts together and give each other our own page to describe what we believe is great. We think this is an effective way to actually come to a definition, because “what is great” is subjective. At the end, we will put together a page with our similar opinions with the conclusion of what we think makes a work great. By 9:00 am, Monday, April 24th one person from your group should post a description of what your group plans to do for the book project. Remember to check all relevant category boxes. If your group is a little undecided, you may propose two descriptions (but no more than two). Each description should include a WHAT and a WHY. THE WHAT is a detailed description of the book (e.g. Making hand bound books from wasted copy paper from expired campus flyers. OR Launching a digital children’s book. OR Choreographing a living book where various students dressed in the words of various pages of the book walk around individually and come together. OR anything else.) You should be as detailed as possible about the WHAT. Don’t just say you’re going to make a physical book or do a performance. Explain the nature of the physical book (size, material, etc.). Detail the vision of the performance (Improvisation? Scripted, Lyrical, Dance? Musical? Three acts? A one person show? A Musical? And so much more.) Your description should be 2-3 paragraphs. THE WHY is where you reflect on how your WHAT satisfies the requirements of the assignment (please see the assignment description). You should explain why you chose the form you chose, and while your explanation might be partly out of personal interest in that form, you need to articulate a rationale that relates that form/medium to the content of your book. How does the form of your particular book speak to the themes/questions/claims you want to highlight in your book? Your WHY should at least be 2-3 substantive and informative sentences, but if you want to write more, you are welcomed to do so. I gave a quick example in class using The Scarlet Letter, but here is another detailed example: Maybe my group is doing the physical book made out of recycled campus flyers. Maybe we came to the idea partly because we were just joking around and partly because half our group is passionate about making Baruch more green and the other half just thought the idea was cool. That’s a fine way to come to the idea (the logistical details of which we will spell out in the WHAT), but then in order to produce a strong WHY, we had to do the WORK of considering how a book made out of expired campus ads might speak to the ideas/themes at play in our novel Beloved? At first it was tough, but then we thought of two things, one that the main character was a fugitive slave, and so there’s something in the print ad that resonates with the danger of escape and hunt. But also the ads we are using are expired, which signifies a passing of the terror, but then by recycling them, we both honor the end of that present life of the ads while acknowledging that something of them lives on. This WHY might be enough right here for the Monday check-in, but since the purpose of the check-in is to get the ball rolling, our group can go go further by 1) limiting the type of expired ads you used, so if you only used ads that seemed to ask students to market or sell themselves or conform themselves to the needs of institutions, well then you can now make your form in even better conversation with the content because just as the form speaks to the content (the ads for runaway slaves) the content of Beloved and the use of the ads in this way gives new life to the content of the ads, making us think about the content of those expired ads in a new light. The concept that stood out to me the most in Beloved was the idea that Sethe “protected” her children by murdering them. My comic strip is my interpretation. I chose this quote, because I wanted to make sense of it for myself. Many characters such as Baby Suggs don’t agree with Sethe’s way, however, Sethe would be considered a character with strong motherly instincts. I was hoping that through a visual representation, I would understand more why she made these choices. The comic strip begins with Sethe holding her new born child. As she looks at the child, she goes from joy to fear. Remembering what kind of world it is for her children. She imagined her child returning to Sweet Home and having the physical and emotional abuse that she once experienced. Drawing the scene was difficult. I thought, how could I portray slavery? But I decided to draw them outside the Sweet Home. The path goes from orange to red, with darker green as the grass so represent the fear and danger Sweet Home holds. After Sethe’s thought of her daughter being taken to the Sweet Home with the school teacher, Sethe realized she needed to give her daughter something better. She didn’t want to let her children live that awfully painful life. I take you from the thought bubble to Sethe back in bed with her infant. She then takes the opportunity to give her a better life by sending her “outside of this place.” She murders the child in hopes it will live a better life. 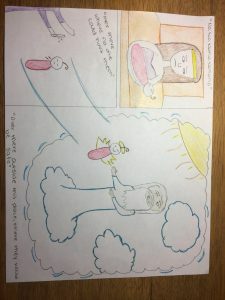 My comic takes the child from the murder scene, out of her mothers hands into the hands of God in heaven. Now she is safe.